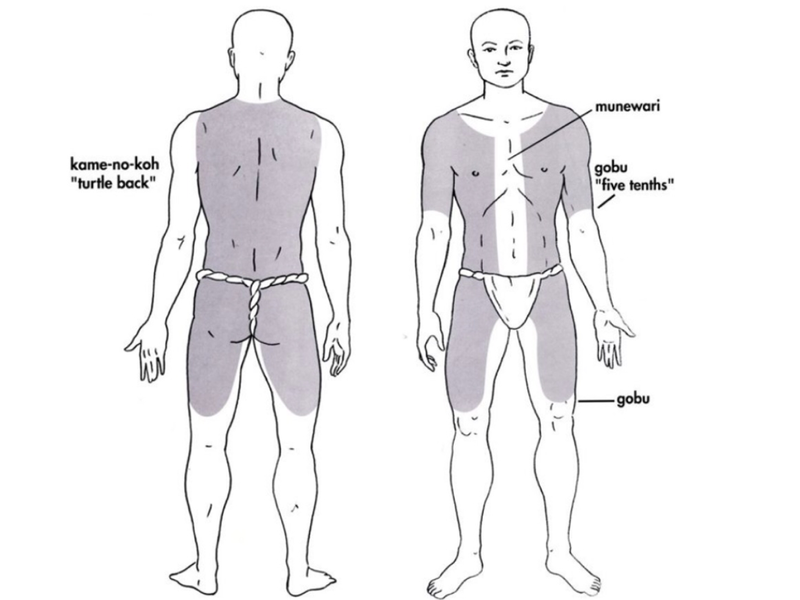 The Japanese tattoo uses the largest surface of the body the entire back area to best showcase it’s power and beauty, the area extends from the top of the shoulders down both sides of the abdomen to end below the buttocks area, from the back the tattoo extends forwards to cover the chest and arms, abdomen and thighs to become one seamless piece. 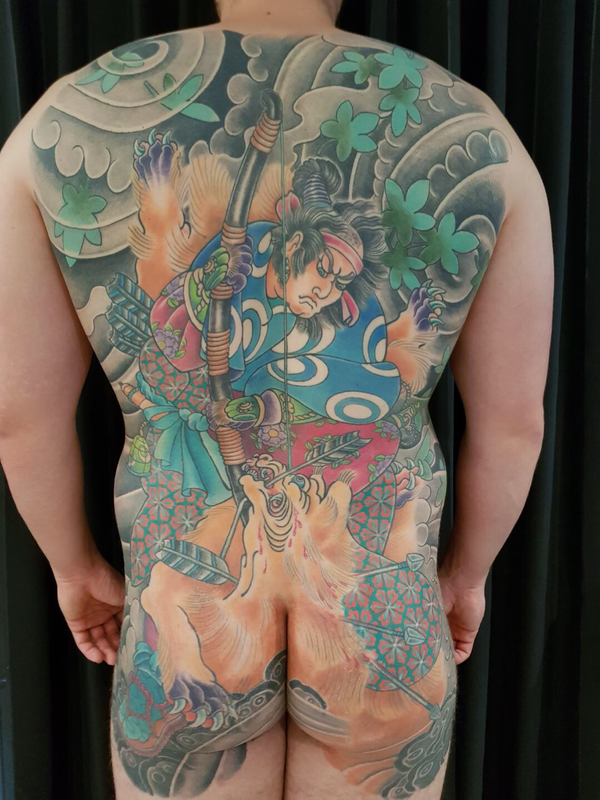 One characteristic that is uniquely Japanese and distinguishes it from other styles is the background shading area in the tattoo, this pattern gives the tattoo depth and perspective, the shading fills on the background area with different tones and shades of ink giving the tattoo a three dimensional effect. 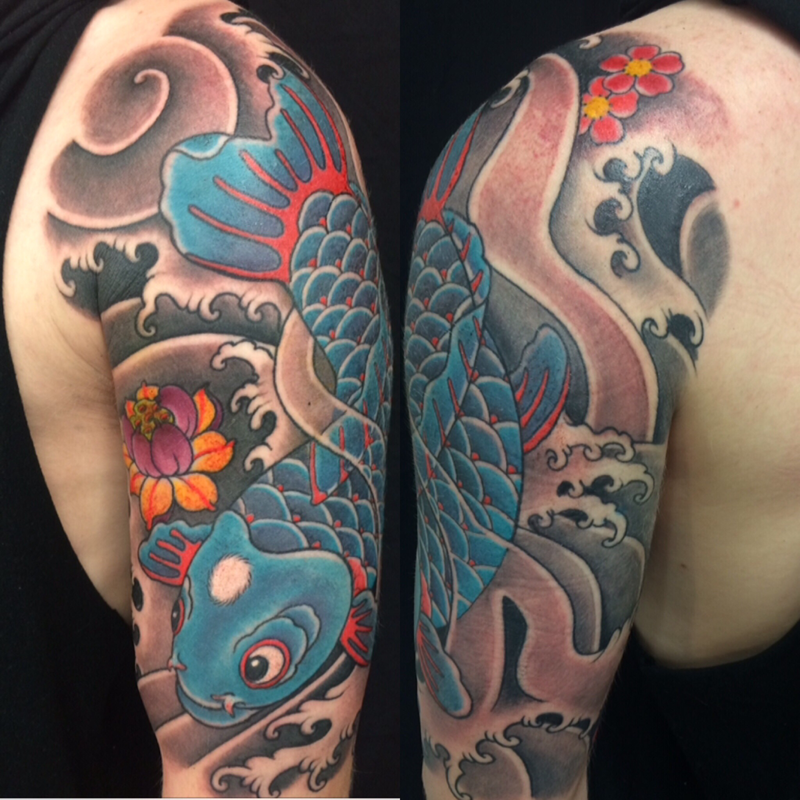 Arms can be full sleeves, three quarter or half sleeve and still hold true to tradition and maintain a powerful look. 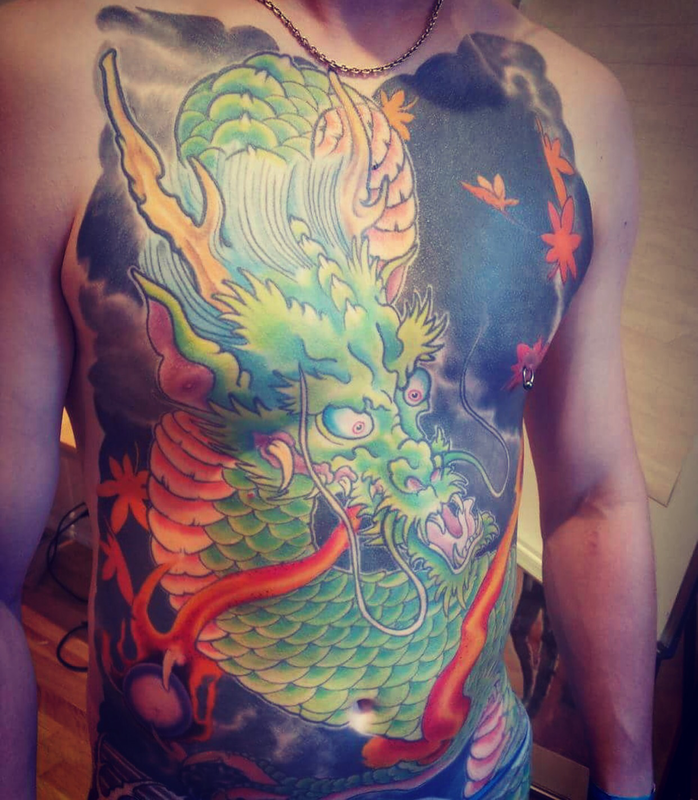 Chest plate tattoos vary slightly between male and female, for males the chest plate covers most of the chest whereas for females a slightly lessened shading style will portray a more feminine look. The elements used are the same and are interchangeable between both sexes and can be used on all areas of the body, sleeves can be done before or after your Backpiece depending on your objectives. Dragon (Japanese, RYU) : symbolism for wisdom, strength, benevolence, purification, fertility, prosperity, compassion, divine wisdom, generosity the universal symbol of the force of Mother Nature. Koi or Carp. 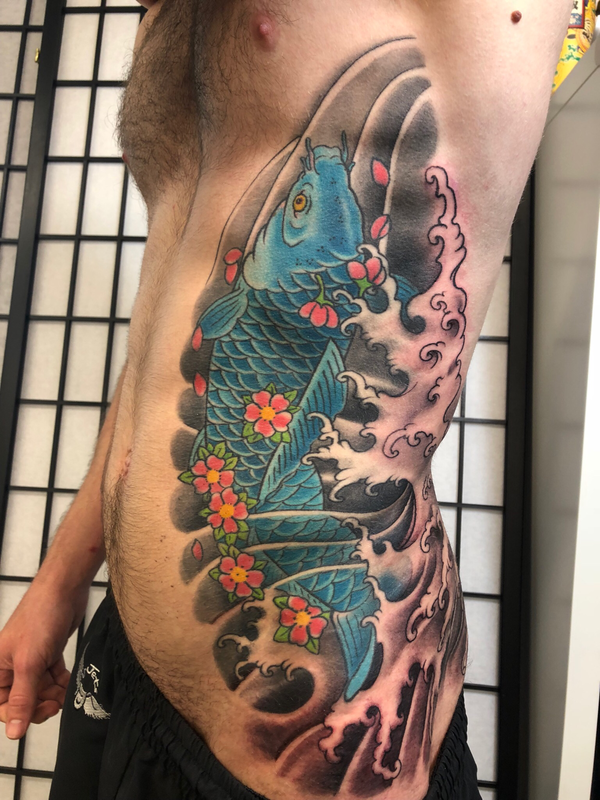 Symbolic of One if the five auspicious animals, the Koi is highly regarded in Japanese culture, its fame originates from a mythical story in which a Koi bravely swims upstream to the waterfalls in the Yellow River towards the Dragons Gate. 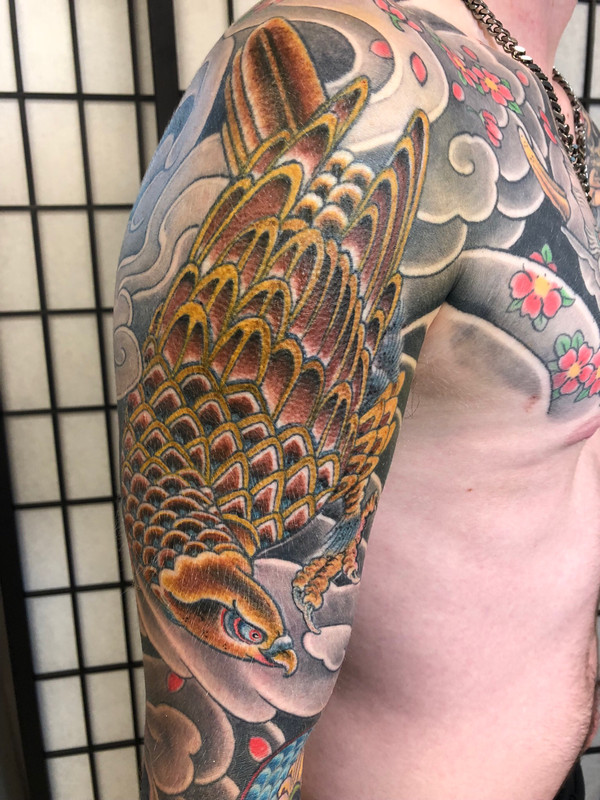 As reward for the courageous achievement the Koi is transformed in a mighty dragon.The koi brings luck to the wearer and is a constant reminder to keep pushing through to overcome life’s obstacles as there is a great reward to follow. Tamatori and the king of the dragons. A women swims quickly towards the shoreline as the King of the dragons pursue her. This famous scene originates from a variation of an ancient Chinese myth that was hugely popular in Japan during the Edo period 1683-1868 especially among ukiyo-e (woodblock) artists, the title translates to “Princess Jewel Taker”. ...The Emperor of the Tang Dynasty sent his wife three treasures to sooth her grief after her father passed away, one of which was a magical pearl stolen by the King of the Dragons, Ryujin. The emperors son vowed to recover the precious object and went searching for the dragons lair. On his long journey he met a princess, fell in love, and married her, hence the name Princess Tamatori. Out of her love for him, she decided to reclaim the artifact, swimming to the underwater palace of the Dragon. Tamatori recovered the pearl and slit her breast open to hide it from the sleeping dragon, the clouds of blood veiling her escape. Barely making it to shore she died in her lovers arms. The Warrior Kadzusa no Suke Hirostune battling with a nine tailed fox. Foxes (Kitsune) are believed to possess superior intelligence, long life and magical powers. They are a type of Yokai and can take on human form and possess human bodies, especially women, young men and the elderly once they reach a certain age usually 100 years. After 1000 years and gaining its ninth tail, a Kitsune turns a golden colour and becomes all powerful with the ability to shapeshift. Raijin was created after the creation of Japan. There is a legend that says the eight lightning gods were charged with protection of the Dharma by the Buddha. 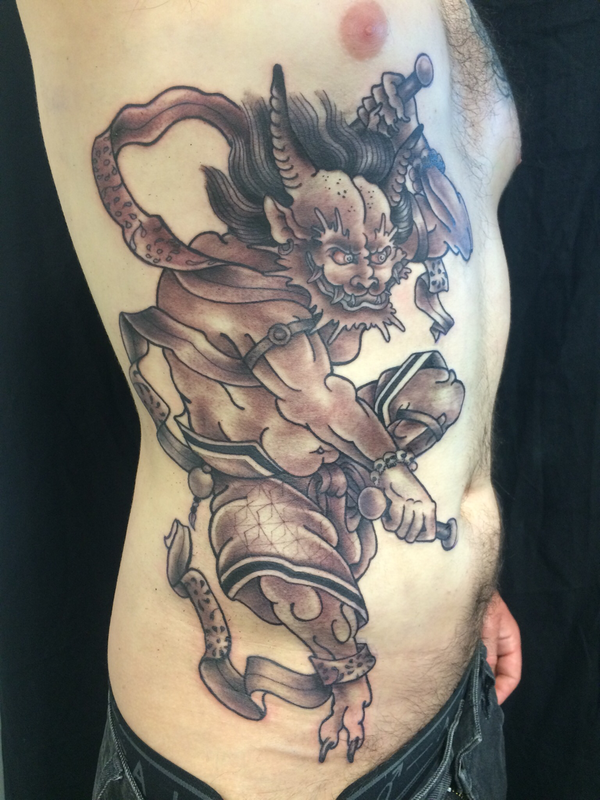 Some Japanese parents tell their children to hide their bellybuttons during thunderstorms because Raijin is credited with eating the children’s naval during thunderstorms.